Today I finalized a short summary of my final report. I thought I should make it available here. Of course it is tempting to continue writing on this one but I thought I better make it available soon so that I have the chance to incorporate concerns and recommendations from anybody willing to provide feedback. Any considerations are greatly appreciated. We spend the night in the house of a family. This is rather simple but lovely and it is nice to keep in touch with the local population. After we got up and have a Khmer style shower in the garden we have some breakfast. This is the kind of breakfast place frequented by Khmer people. Those places can be found all over the country and Phnom Penh is no exception. They offer good and very cheap food and this is the way most Cambodians have breakfast. It is sort of difficult to get to the areas in which indigenous peoples live in this province. One of those areas is Siem Pang in the north, directly at the border to Laos. The other area is in the east and we learned that it would be very difficult to get there in the rainy season and impossible to get there within our tight schedule. 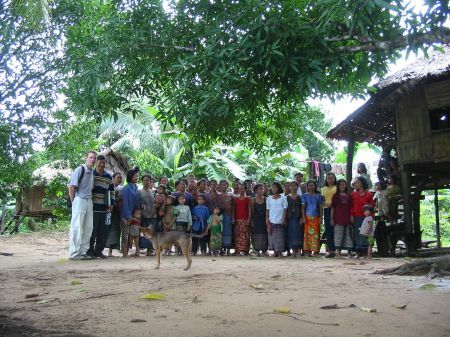 So we decide to visit various communes and villages in Siem Pang. There is no road to this area and the boat it the only way to make it. At the same time it is about 100 km from Stung Treng town and we do not have much time. So what we need is a fast boat. We are lucky, because what is available here is called fast boat and really deserves the name. Those are fast boats. They are imported from Thailand and Laos and designed for maximal speed. 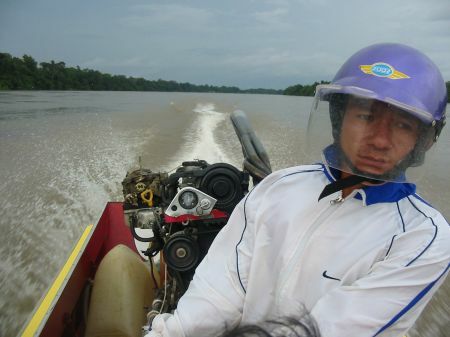 Those boats have powerful engines and can easily make 60 km per hour. However, they are extremely sensitive when it comes to waves. They are mostly used to cross the border to Laos and this is what most tourists do when they come here. 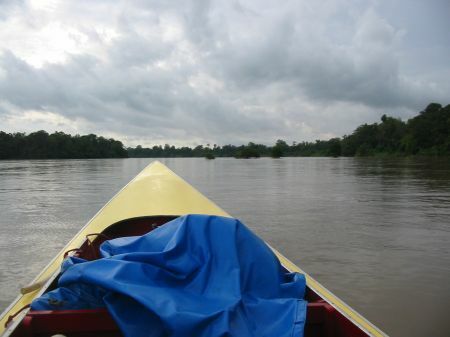 There are not many options for us to go to Stung Treng, particularly when considering our tight schedule. So we decide to rent a pick up and start very early in the morning, which costs us about $40 for the four hour ride. However, we thought this way we can meet the government representative there before the extensive lunch break and start conducting interviews as early as the afternoon of the same day. We start at about 5 am, which really is very early for me. I do not get much sleep anymore anyway. So as soon as we sit in the car I try to go back to sleep again. Surprisingly the car is the same with which I made the trip from Strung Treng to Banlung when I came here the first time. After we have been driving for some time we have some minor problems with the car. This is Monday. I spend the day again talking to several local activists and organization. In addition, I am still busy typing all the notes I took during so many interviews. And I have to arrange for the transportation to Stung Treng province the next day. So I take only very few pictures. This is a place close to the market. Youngsters come here to hang out and play billiard. This is Saturday. In the morning we went to see the guy who is working as education advisor for CARE. He has been working in indigenous education all his life and is actually from Australia. We had a long and very open discussion. I enjoyed having a discussion in English without translation, which makes the event much more delightful for me. I learned a lot about the education project, the governments approach to indigenous rights in general and indigenous education and the local situation in comparative perspective in particular. Furthermore he liked â€˜myâ€™ theory of indigenous rights. After a good discussion we agreed to keep in touch and provide each other with documents and information. Even out here in Rattanakiri there are Pagodas and monks who are traveling the streets in the morning to collect food from the people. This picture is taken from the balcony of the guesthouse in the morning. Again, I cannot but make this a very short report. In the morning of the next day we meet some of the authorities as well as major local NGOs. We are happy enough to be provided by the local PLG project (which is actually a UNDP project) with a capable car including driver for just covering the costs of petrol. We have a tight schedule and want to meet a number of Commune Councils as well as members of the local indigenous communities. My work keeps me busy and I do not find time to more general reflection. I do not even find time to answer my mail. Sorry for that. I will be in Kratie for another week. However, I changed the schedule and will come back to Phnom Penh before I travel to Mondulkiri and continue fieldwork. I thought it might be a good idea to provide my research outline and rational as well as the guiding questions that I use to conduct my (semi-standardized) interviews. However, I did not find time to update it dititaly and this reflects the situation rather three weeks ago. I will provide the update on this as soon as I get back from Kratie. There is not much party program and not even ideology involved in the current election campaign in Cambodia. Typically, the campaigns try to promote their party leaders. In the case of the three big parties this is Prime Minister Hun Sen (CPP), Sam Rainsy (Sam Rainsy Party), and Prince Norodom Ranariddh (Funcinpec). Once more I found the Cambodia Daily to be a reliable newspaper. They had contacted all parties and requested their profiles. Thy print the replies of about 20 parties, among them the three big parties. I though it would be worth to provide those valuable pieces of party program here. Much could be said about those platforms and the high expectations they raise among the supporters of those parties. I think I may refer to it later. With regard to multiculturalism it is worth mentioning that both major opposition parties (Sam Rainsy and Funcinpec) play the nationalist card. â€œIllegal immigrationâ€� by Vietnamese people and issues of territorial integrity (with reference to both Vietnam and, to a lesser extend, Thailand) are high on the campaign agendas. Those platforms also reflect the different pressures which last on parties according to whether or not they participate in the current government (CPP and Funcinpec). Interestingly, the ruling party CPPâ€™s platform is the only who mentions â€˜hill tribe peoplesâ€™. However, the formulation â€˜take care of the hill tribe peoplesâ€™ sounds rather paternalistic to me. Implement the national policy of unity and reconciliation, strengthening peace and social stability, and seek justice for the people who suffered under the genocidal regime. Strengthen and promote democracy, the multi party liberal system, promoting free and fair elections, protecting the rights of liberty and freedom for the people according to the UN declaration on human rights. Respect Buddhism as the state religion and respect the rights of other religions, strengthening freedoms of the media and the rights of unions and vocational organizations. Strengthen the rule of law and law enforcement. Strengthen the commune councils and improve quality of public service at local level. Build up national defense by using Royal Cambodian Armed Forces as the core. Implement the free market economic policies. Ensure economic growth, encouraging internal and external investment. Increase employment rate. Increase salaries for civil servants, armed forces and workers according to growth of national economy. Foster private development and create new jobs. Develop agricultural sector and increase agricultural exports. Take care of the hill tribe peoples and increase services to vulnerable groups. Increase rights of women, the disabled and children. Combat trafficking of drugs and humans and stop domestic violence. Develop tourism to its potential. Continue to build pagodas, schools, health centers, roads, bridges, irrigation systems, electricity and water supply for the people. Develop peace and friendship with all countries based on principles of equality and respect for independence and territorial integrity. Improve cooperation with donor community and international institutions. The Cambodians will enjoy a dignified living standard under a Sam Rainsy government that will immediately apply, and adhere to, the rule of law. The rule of law helps eliminate corruption that has artificially kept market prices high. For instance, without corruption, the price of petrol at the pump can be decreased to about 1.500 riel per liter, and prices of other utilities and products that use petrol directly and indirectly as production input will inevitably drop. The rule of law will also deliver justice in court for the people. Bribing judges to win a case is no longer a safe option for the rich. The people will also benefit from social justice. The party will tax the rich to pay for higher salaries for all teachers and public servants. The less-corrupt industries will deliver higher wages for factory workers. The retired, the handicapped and the poor will receive social security benefits that are funded by the tax revenues of the rich. Another major concern of the Cambodian people, the issue of territorial integrity, will be diligently addressed with peaceful and legal means. The national immigration law will be properly implemented for foreigners. Above all, the Sam Rainsy government would have a leadership team capable of, and fully committed to, making its policies work. Yan Tuel is feeling ignored. With just two weeks until Election Day, Tuel does not know who he will vote for. He cannot tell the difference between the logos of the parties running in his province, and like 80 percent of the people in remote Ratanakkiri, he is illiterate. But so far, no party has come to tell Tuel why he should support them. Tuel belongs to the Tumpuan tribe, one of eight ethnic groups indigenous to the highlands. Collectively known as chunchiet, they comprise over two-thirds of Ratanakkiri population. The Cambodian Peopleâ€™s Party (CPP) has been firmly entrenched in the province since 1993, and the one seat up for grabs on July 27 looks likely to stay in its hands. But Tuel has other concerns. .His wife is ill, and he cannot afford to take her to hospital. Instead he will pray to the gods for her recovery. His Problem is not uncommon in Ratanakkiri, one of the poorest provinces. Decades of war and isolation have taken their toll: healthcare is basic, education limited, and people suffer at the hands of unscrupulous businessmen. Sam Oeun, a student and volunteer at Ratanakkiri-based NGO Non-Timber Forest Products (NTFP), says the chunchietâ€™s day-to-day concerns often outweigh political ones. â€œSome of the just think whether or not they have enough to eat today and tomorrow,â€� he says. Bringing voter education to the villagers is also a problem. The indigenous groups speak different languages, and this, combined with high illiteracy levels and low education, means information is best spread by word of mouth. Meas Khlemsa of Comfrel, an election monitoring NGO, says the organization has been running training courses and distributing pamphlets detailing the policies of all 23 competing parties. â€œComfrel tries its best to tell the people it is their duty and their right to vote to make a change in the country,â€� he says. But despite the best efforts of NGOs, information does not appear to have reached the length and breadth of the province. The political parties are not making much headway either. 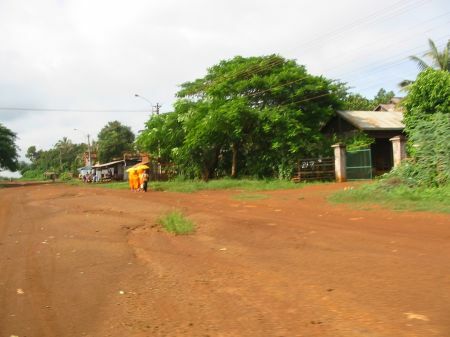 The apparently lackluster campaigning could be due to the inaccessibility of the villages â€“ roads turn to rivers in the rainy season. Perhaps before polling day there will be a flurry of countryside visits. Or, in what looks like a one horse race, are the other parties despondent? The CPP has long had an iron grip on the province. Deputy provincial chief Muong Pay says his party owes its continuing success to development and its role in defeating the Khmer Rouge. This popularity is visible along Road 19, which runs through the heart of the chunchiet areas up to the Vietnamese border. CPP signs are frequent, as is praise for the ruling party. All the villagers speak of gifts from the ruling party, but the competition is skeptical about the CPPâ€™s handouts. Funcinpecâ€™s Hor Ang insists the CPPâ€™s popularity persists only because of this material support, and maintains its policies are actually harming livelihoods. â€œOn the surface it seems that the CPP is helping the people, but in fact the land and the forest are being destroyed by the CPP,â€� he says. Ang is referring to illegal logging, which has plagued the heavily forested northern provinces for years. The indigenous people also found that land they had lived on for generations was claimed by outsiders. NTFPâ€™s Sam Oeun describes one such case. However Ang says such incidents do not damage the CPPâ€™s vote. â€œMost people donâ€™t care about violations on land because they move away,â€� he says. But opposition parties are not admitting defeat. The SRP recently gained popularity in the province when it won the only non-CPP commune chief position here in 2002. In a province with a large and porous border with Vietnam, the SRPâ€™s hard stance on immigration and border encroachment could prove popular with the Khmer electorate. However none of the chunchiet the Post spoke with said such issues worried them. Even near the border, villagers expressed no concern about their neighbor. 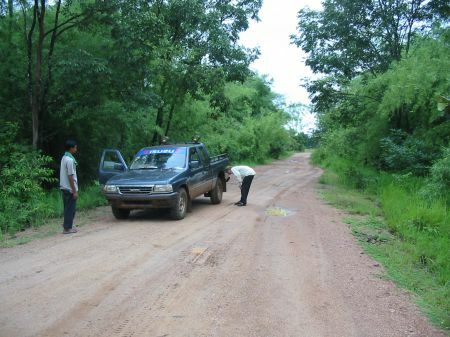 Most chunchiet villagers say border squabbles are not a priority â€“ they are still waiting for the basics. 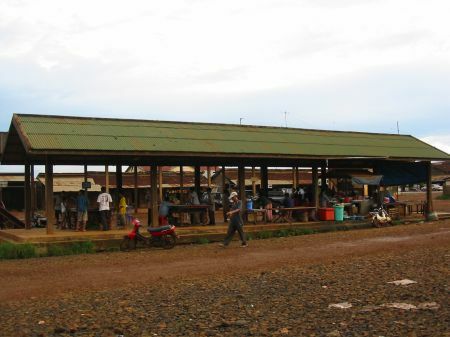 VEUN SAI DISTRICT, Rattanakiri province â€“ Bou On knows change is coming. Her eyes, milky with age, have seen a jungle footpath swell into a full-sized road. Theyâ€™ve squinted into a sun reflected from tin roofs that were once wood. And theyâ€™ve helplessly followed the footsteps of unwelcome visitors trading on sacred ground.. Caught between their past and their future, the Kachon Krom villagers of Kachno commune are angry and scared. An ancient burial ground resting in the hill tribe community has become a highly coveted tourist attraction, drawing visitors from around the world. But the development that should make them rich is instead making them poor. â€œWhen the tourists come, the soul is awakened and the angry spirits demand a new home be built. Even the poorest family must sacrifice at least one cow, chicken and pig. We just cannot afford this,â€œ said 60-year-old Bou On, who is a mix of Laotian and Tampuen. Standing no taller than a healthy 10-year-old girl, Bou Onâ€™s frame is slight but her stance firm. She is unwavering in her belief about the cemeteryâ€™s rules and the consequences of breading them. A group of village elders recently wrote a letter to the provincial government requesting their support to prohibit tourists from disturbing the spirits. They even have appealed to Bou Onâ€™s brother, former CPP defense minister and deputy prime minister Bou Thong, for help. Bout Thong, now a parliamentarian and the fifth-ranking member of the CPPâ€™s elite Standing Committee, had donated buffalo and rice to appease the spirits but suggested no more than a protective fence to solve the problem, they said. Bou Thong had declined to be interviewed. Now elders are relying on younger residents, like Om Mean, to find a solution. More mud than clothes cover Om Meanâ€™s body as he balances a pile of warning notices on his bicycle handlebars. A young disciple preaching his eldersâ€™ words, the 26-year-old member of the villageâ€™s natural resource committee passes a paper to each person he meets. â€œTourists should not come, because this is a ghost world separate from the human world,â€� he said, standing on a new road that cuts the cemetery in half. Small houses capped with pointed roofs and enclosed by thin wooden fences surround him. Totem poles roughly carved into the shape of men and women stand tall beside the houses, symbolizing the servants of the dead. They bear wooden elephant tusks and riches, a wish for prosperity in the life to come. The wooden mobile phones and tin bras appearing on the latest totems testify to a recent merger between tradition and modernity. Three warning signs printed in Khmer and English should be enough to keep visitors from touching the totems, but if tour groups insist of on breading the rules, â€œmilitant actionâ€™ must be taken, Om Mean said. It would be a lonely battle, as provincial government officials are unwilling to take firm action no the matter. 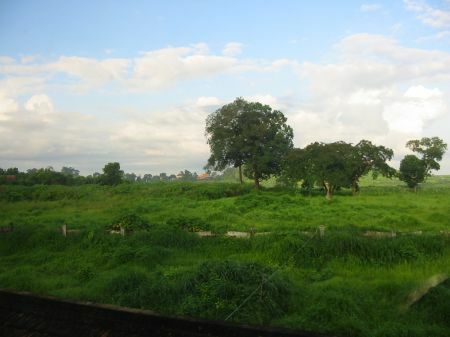 Ratanakkiri is Cambodiaâ€™s largest eco-tourism destination and fourth on the governmentâ€™s list of tourism development priorities. The internationally renowned Lonely Planed travel book even advises travelers to make the trip to Kachonâ€™s cemetery. Plans for a new airport and improved roads throughout Cambodia-including one highway planned to got through neighboring Stung Treng province-could transform the province within the next couple of years. The last thing the government wants to do is dissuade visitors from coming, said Ratanakkiri Governor Khma Khoeun. Economic constraints will likely alter villagersâ€™ traditional belief systems, Kham Khoeun said, adding that in a few years the elders would realize their wrongs. The seven ethnic minorities and the ethnic Khmer, Laotian and Vietnamese residents occupying Ratanakkiri have already laid the groundwork for a collision of cultures, which is not necessarily bad, according to Jan Noorlander, CAREâ€™s Highland Childrenâ€™ Education Project manager. â€œA clash of cultures is natural and makes and area more economically viable. People thrive off it. But if theyâ€™re not the agents of their own change, people may suffer from it, rather than benefit,â€� he said. Over the past five years, an influx of tourists and new residents has rapidly introducing new technology, clothing and languages to the provinceâ€™s many hill tribes. Sixty-five percent oft the population is comprised of ethnic minorities, most of whom practice animism and speak distinct dialects. Their belief systems differ greatly from Khmer culture, and impel many hill tribes to appeal to spirits for a malaria cure or a good harvest. The risk of rapid cultural integration or homogenization, Noorlander said, is creating a culture of shame. No major ideological divide separates older Kachon Krom villagers from their younger counterparts, they said. But the passage of time may mean the loss of history and a commitment to preserve the past for the future. Maoeun Choeun, 18, dropped out of second grade years ago to till his familyâ€™s soil. He knows little about the spirituals. But he works and lives beside his elders and agrees with them because he respects them. I should mention that I intend to travel to Rattanakiri next Tuesday. I do not know how often I will have the chance to access this log prior to my departure and therefore give some information in advance. I do not intend to take my laptop with me. This is mostly because I did not manage to connect it to the network and therefore could not properly back up my computer. I do not want to risk my data. However, I take my camera with me and more than 400 mb of memory. This way I hope I can provide numerous pictures afterwards. I mentioned earlier that I believe this situation makes Rattanakiri a challenge to both decentralization and democratization of the political system. I contacted various organizations which have operations in this province and I am confident that they will assist in my research. I will travel with another of our project translators. He is political scientist, CPP member and writes his master about political parties. Given that Sunday is election I cannot expect him to stay longer than until Friday. However, if I find local organizations on the spot that make meaningful research possible without my co-traveler being present I tend to think that I stay longer. Even with regard to security concerns involving the upcoming election this would seem to be a rational decision, since political unrest caused by national election is not likely to have heavy impacts in such a remote province (which people told me is a different Cambodia). Since I have my mosquito net as well as two sorts of mosquito repellent with me I think I am on the save side with regard to the only thing which limits the delight of traveling Rattanakiri. What is Behind Fancy Publications? It might appear from this log that I predominantly travel. However, the opposite is the case and I spend Monday to Friday in the office digging in documents and trying to get appointments with people who help me understand the issues. Certainly it is not my business to scrutinize what the World Bank is doing here. However, this institution is a major player in development policy in Cambodia not least because Cambodia happens to be a very poor country and because the World Bank is in some ways just that: a bank. At the same time the globalization of particularly financial markets gives this organization as well as its sister institution IWF enormous leverage to intervene in domestic politics of receiving countries. Although these organizations mandate is explicitly not political there can be no doubt that they exercise enormous political power in receiving countries. Since at the same time these organizations have no democratic legitimacy whatsoever in the country which’s policies they happen to shape, there has been quite some controversy even about whether or not the World Bank is of any help at all for any meaningful concept of development. As a result of this crisis of legitimacy World Bank has struggled and enormously changed their rhetoric. Moreover, World Bank felt pressured to indeed make significant amounts of research results, policy literature and even project documentation online available. At the same time they adapted progressive mottos like ‘our dream is a world free of poverty’ or so. Moreover they claim to refocus their strategy on poverty reduction (as opposed to just economic growth) and keep talking about things that have always been alien to their operations like empowerment, participation, ecology. And indigenous rights. The reflection of the later is apparently Operational Directive 4.2 which defines the norm according to which projects are supposed to be financed and implemented. Or in case of failure to live up to this definition of the norm not financed and not implemented. I should point out that World Bank has not exactly voluntarily adopted either this or many other of recent changes but has done so because of significant political pressure. Interestingly, even right wing libertarian conservatives in the US Congress have in times contemplated to get rid of World Bank entirely. Therefore I am very interested to learn whether they changed their ways or just the way they talk about them. For this reason I feel kind of tempted to investigate what they are doing, which again, is not precisely what the focus of my research is. I mentioned earlier that there are a number of high solution publications issued by WB and Asian Development Bank. Those organizations as well as the UN, International Labor Organization (ILO), EU and so on have established various instruments in international law to protect the rights of minority cultures, particularly indigenous peoples. At the same time there is an IDA commitment (that is: cheap WB money) of about 20 $mill US pending here in Cambodia. There are objections to this program particularly because it does not seem to live up to those (more or less binding) international norms. And again at the same time there has been a “Highland Peoples Development Plan” carefully drafted with substantial assistance and support by most of precisely those organizations. It is, as I mentioned, not in power because there are objections, particularly to Article 3.6. I typed that early and do not do it here again. However, it is very plausible that a policy that has been possible only with the support of those organizations reflect their policy on the rights of these vulnerable groups. There are strong indications that the critical objection comes from the Department of Forestry and Wildlife in the Ministry of Agriculture. I heard on several occasions that this ministry does not cooperate and everybody recommends bypassing them. However, at the same time this ministry is among the most powerful, not least because the government perceives all the forest which is not privately owned, as their property. This department controls the concessions for the cutting of forest. Already some weeks ago I called somebody relevant at the World Bank in Phnom Penh to ask whether they can provide me with their analytical work which apparently needs to be done to determine whether or not government programs actually meet WB’s policy on indigenous people. The person was very friendly but could not help me and gave me the number of somebody she told me would be able to help me. I called this person, he noted my email and told me he would send me electronic documents. However, I never received any. Interestingly, I even talked to somebody relevant from Asian Development Bank and he quite frankly told me that his organization might have a similar policy on indigenous people similar to World Bank’s OP 4.2. but this does not mean they share their analytical work with his organization. Elsewhere I heard that the World Bank office in Cambodia would be similar to World Bank offices anywhere in that they would not like to share their assessments and documentations. I should mention that from the newspaper and comments from all sorts of people it seems to me that there is a lot of illegal logging going on, with particular involvement by the military. I heard for example that a powerful military leader occupied a four digit number of hectare forest and declared it his property. There was some protest against it and Prime Minister Hun Sen decided to just buy the forest back from his private money (what ever the Prime ministers private money means in Cambodia). However, there is this Department of Forestry and I managed to get an appointment with its head. But when I arrived he was busy. So I got to speak to his deputy. Although it is precisely here were objections to the policy on “highland peoples” are coming from, this person really did not have many answers. He actually did not even seem to know what I was talking about. However, he was very kind and so was I. I was there with our translator. Since I cannot speak the official language of this country I am carefully trying not to act insensitive. However, he did not only give indirect answers to direct questions but no answer whatsoever except for commonplaces. The most precise thing I learned is that there is a legal guarantee that all the people living near by the forest have free access to it and can freely slash. However, there is no special provision for indigenous or “highland” people. This apparently refers to the new forestry law which has been finalized few weeks ago. I learned that an English translation would not be available earlier then in two weeks. I also mentioned earlier that, with regard to another project, the World Bank had determined that OD 4.2 applies with reference to “Highland Peoples” who maintain cultural and socioeconomic practices different than those practices by the Khmer national majority. Moreover, it appears to me that a forest law in the context of Cambodia is even more critical to the well-being of indigenous peoples than the project with regard to which the determination of “Highland Peoples” as subject to OP 4.2 has taken place. So it is hard to imagine that anybody in the World Bank could consistently argue that in the case of one project this directive applies to “Highland People” but not in another project. I mentioned earlier that the final decision on the “Highland Peoples Development Plan” in the Council of Ministers (which is the government) was postponed because a precise law on both land and forestry was lacking. And I mentioned that those laws are in power today. This law is apparently one of them and it is hard to imagine that the deputy of the department presumably responsible for the drafting does not know that it was precisely the “Highland Peoples Development Plan” which made necessary the forestry law. I furthermore thing that somebody who works in a management position in any Department of Forestry can be expected to think about how a forestry law affects indigenous people living in and depending on the forest in the country. After all, even in Cambodia they happen to be citizens with certain rights. What, however, is really outrageous is that the very same person’s name card says “World Bank Forest Concession Management & Control Pilot Project”. This is so for several reasons. First, there can be no doubt that “Forest Concession” policy is among the most critical for indigenous people, since whether a particular concession is issued or not determines whether their homeland remain in tact and allows for their cultural survival. Second, if this is a World Bank project, this person can not only be expected to know about the World Bank’s policy on indigenous people but needs to be required to know about it. His decisions are exactly what is required to live up to this policy before any project is confirmed. And third, as if this would not be enough, what he is doing is supposed to be a pilot project, which I take to mean it is supposed to provide good example and possibly best practices. To wrap it up: If I understand this situation rights this really is a serious issue. With regard to the World Bank I continue for the time being to seriously question whether this institution’s decisions actually live up to or even consider their well worded policy on indigenous people. If anybody can help me to better understand what is going on here I would greatly appreciate it. If what I wrote here really reflects what happens right now than I would like to see somebody doing something about it. I really wonder where all these organizations are who provided assistance to the “Highland Peoples Development Plan” in the first place and would like to learn what they are doing right now. It appears to me that an IDA commitment of more than 24 US $ Mio. 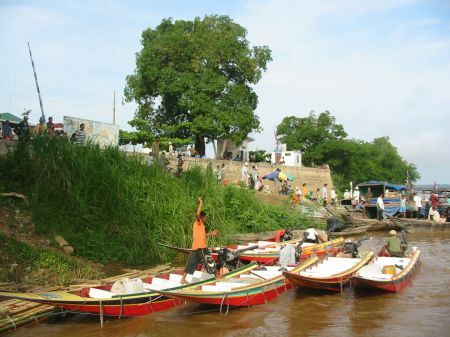 Provides significant leverage to do something for the situation of indigenous people. Right now it appears that this really is not high on the agenda after the election. Continue reading What is Behind Fancy Publications? Posted on 19.7.2003 24.3.2006 Categories cultural diversity, GeneralLeave a comment on What is Behind Fancy Publications? I found the following English newspaper particularly helpful: The Cambodia Daily and the Phnom Penh Post , which publishes biweekly. Recently, I found a number of articles that I found to be insightful with regard to cultural diversity. The author goes into more detail of the EFA strategy and mentions that â€œa national scholarship system for girls will be introduced, and ethnic minorities will have culturally-tailored curricula which aim to preserve their local knowledge and make education relevant to their cultureâ€�. This appears to be a honorable endeavor and sounds very progressive to me. Particularly given the common hostile attitude against particular minorities. However I will try to get hold of somebody who is designing this policy to learn how they do this. This is especially interesting because their does not seem to be much knowledge even about what language those people actually speak. The formulation that the program aims at â€˜making education relevant to their cultureâ€™ is odd and would not be out of context with aggressively assimilation policies. In the same issue of the same newspaper Michael Coren writes in an essay titled â€œWhatâ€™s in a word? More to yuon than sour soupâ€� about the widespread use of the term yuon even among top politicians. This term apparently refers to sour soup as well as to Vietnamese people. It has several notions but is apparently meant and felt like a racist insult in most contexts.